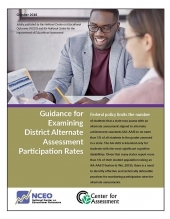 This Brief addresses important questions that arise for states as they implement federal alternate assessments aligned to alternate achievement standards (AA-AAS) participation requirements. Federal policy limits the number of students that a state may assess with an AA-AAS to no more than 1% of all students in the grades assessed in a state. The AA-AAS is intended only for students with the most significant cognitive disabilities. Given that many states report more than 1% of their student population taking an AA-AAS, there is a need to identify effective and technically defensible practices for monitoring participation rates for alternate assessments.